Cornwall is a fantastic place to bring your four legged friend along to join in some family fun time. 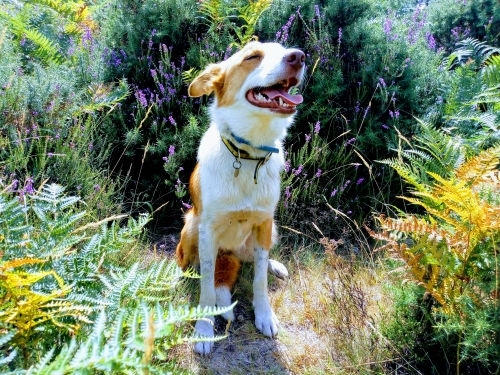 There are beaches, walks, gardens and a host of activities where well behaved dogs are made to feel very welcome! Built between 1539 and 1545 by Henry V111, Pendennis Castle fits the bill for a fun and educational family day out, dogs are welcome both inside the buildings and the surrounding areas as long as they are kept on a lead throughout your visit. Events are scheduled throughout the Year to suit all ages, from Medieval Jousting Displays to a Pirate's Attack ! A 'must do' is to take a look at the display of large guns dating back from the Tudor era through to 20th Century. Take in the surrounding views from the castle over the Fal Estuary and out to the ocean as they are simply stunning. If you are feeling peckish after all this activity, the cafe at Pendennis will satisfy your hunger pangs! Providing locally sourced Cornish fayre you will be sure to find something tasty to enjoy. Spoil the family and take them on a steam locomotive for a 12 mile return trip back in time via the Bodmin and Wenford Railway. Departing from Bodmin Parkway, sit back and relax whilst travelling through beautiful countryside meandering alongside the route. Assorted special events take place throughout the Year with fun characters sometimes appearing on the platform and inside the locomotives during school holidays, a great way to keep the kids amused! Our four legged friends are very welcome to join their owners for the ride, just as long as they are kept on a short lead and stay on the floor ! Everyone, including the family dog will enjoy an informative and fun day spent at Wheal Martin Clay Works where you can explore the new China Clay exhibition - 'from Cornwall to the World' to see how the challenge of exporting clay around the world is met. Visit the museum to learn about Cornwall's mining heritage, you will also be able to view Cornwall's largest working water wheel in action! Find the visitor's platform, where you can take a peek at what's happening in a working china clay pit, follow the nature trails and pretty woodland walks meandering throughout the site. After all this activity, why not visit their licensed cafe, with outside terraces to enjoy locally sourced food. Dogs on leads are allowed throughout the site, so they get to enjoy fun too! This beautiful sandy beach is dog friendly all year round and well behaved humans are allowed too ! The sand is a gorgeous soft caramel - just the right texture for building huge moats and sandcastles ! There are loads of splashy rockpools where kids and dogs can jump in and out of. The Port William Inn sits on the clifftop, perched above the beach, providing a great selection of locally sourced food to enjoy, their pizzas are to die for ... If it's a sunny day, bag a table outside and take in the spectacular views over the ocean ! This local dog friendly walk is a great one any time of year, although particularly during spring and summertime. The starting point is an amble down the lane from Badgers Sett Holiday Cottages, to Draynes Bridge. There is lots to see during this ramble, with wild flowers bursting into life in the hedgerows and the beautiful Golitha Falls with its tumbling mini waterfalls. The kids and dogs will adore splashing in, out and over the water at Golitha and exploring Sibleyback with it's children's play area and huge lake. Dogs to be kept on leads whilst walking round the lake. If tummies start to rumble, you have a choice of snacking at Inkies (Golitha Falls car park) or the cafe at Siblyback, both serving locally sourced yummy treats. To book a short break or longer in one of our cottages at Badgers Sett, click here or contact Julie on: 01579 320741.